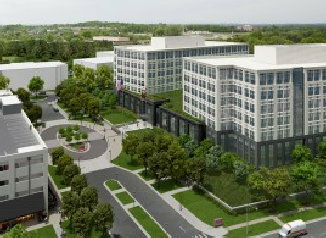 The new research campus of the National Cancer Institute will be a part of the Johns Hopkins University property in the Shady Grove Life Sciences Center. This 100-acre development includes a 575,000 gsf building and a 600,000 gsf parking structure. The building is comprised of two wings connected with a shared lobby and retail space. The towers have eight floors and are connected at the ground, first and second floors. The building is designed to meet ISC Level IV blast and security criteria.